Join us for a free open house and explore the new Hood Museum of Art! Join us for a free open house and explore the new Hood Museum of Art! 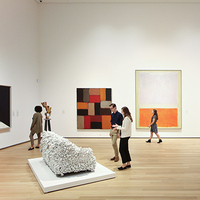 Seek out some of your favorite works and discover exciting new ones. Wander on your own, or use our fun prompts to guide you. Our staff will be on hand to answer questions. Hot coffee, cider, and other refreshments will be available in the new atrium, along with T-shirts and other giveaways while supplies last. Enjoy live music in the afternoon and learn about our upcoming programs while you’re here.